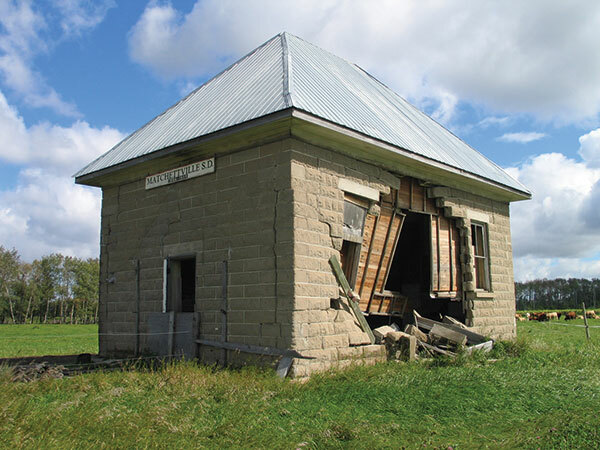 The MHS is compiling an inventory of historic sites around Manitoba as an encouragement to tourism and management. Some sites in that inventory are featured in issues of Manitoba History. Eds. 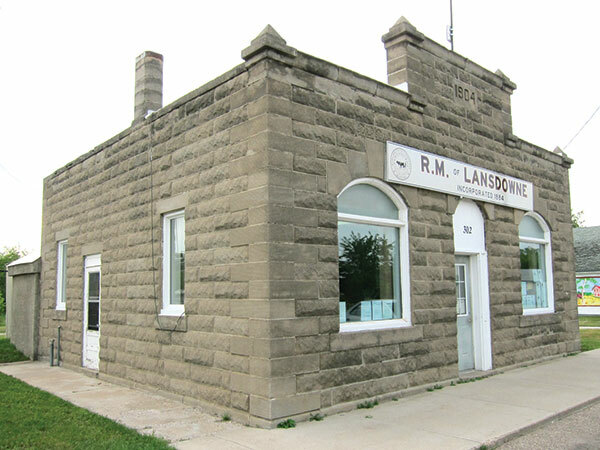 For a few years in the early 20th century, numerous buildings around southern Manitoba were constructed of a unique, locally-made material: concrete blocks. Using a machine bought from a mail-order catalogue, wet concrete (a mixture of cement, gravel, and water) was poured into a mould where it would set until hard. The ease with which the blocks could be made at the construction site, with limited investment of resources—unlike bricks, which typically required a kiln for high-temperature firing—was probably their primary attraction. 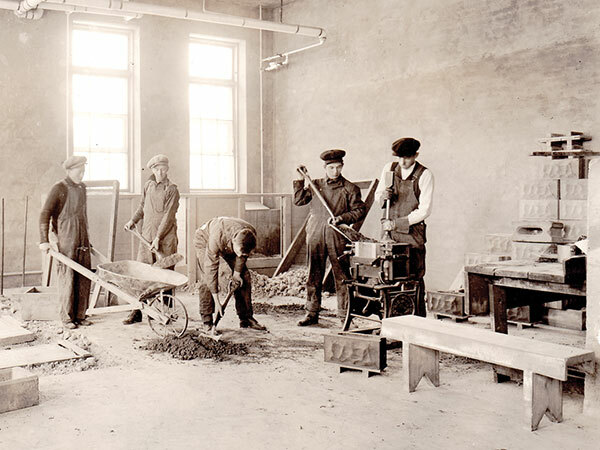 Concrete block making is demonstrated in this photo from around 1917, at the Manitoba Agricultural College (now the University of Manitoba). Source: Archives of Manitoba, University of Manitoba, Fort Garry Site #15. Much larger in size than bricks, these distinctive blocks measured up to 30 to 32 inches long, 9 to 10 inches tall, and 3 inches or more thick, and weighed over 50 pounds each. They were hollow and typically flat on the interior face but variously patterned on the exterior face. Often, multiple patterns would be incorporated into a single building. 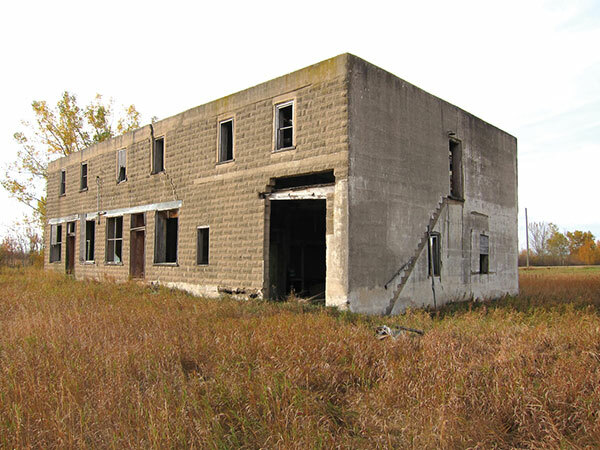 Today, there are several “hot spots” of concrete block buildings around Manitoba, probably because those areas had advocates or businessmen who promoted their use. Some of these “block boosters” included Frank Thomson at Austin, David Wright at Emerson, L. C. McIntosh in the Rural Municipality of Winchester, and William J. McKinney in the Rural Municipality of Morton. An especially high concentration can be found at Arden and the surrounding Rural Municipality of Lansdowne. There, starting in early 1904, blocks were made by the Arden Cement Block and Building Company. Partners in the enterprise included hardware merchant and tinsmith John A. Gilhuly, merchant and municipal official Maurice E. Boughton, carpenters George and William Stockdale, and stonemasons Robert Lamb and John Samuel McGorman. 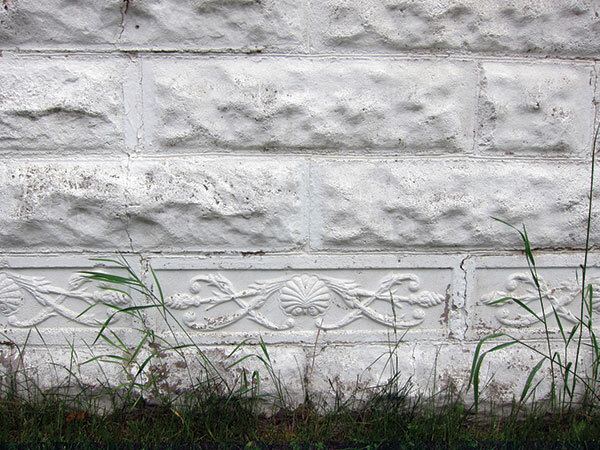 Concrete blocks used to build a private residence in Austin have at least two different patterns on their exterior surfaces. Though manufactured easily, the blocks provided limited insulation value. Residents of concrete block buildings have told me they find the structures cool in winter and warm in summer. Perhaps it was this disadvantage that made the blocks lose favour as quickly as they gained it. Whatever the reason, use of the blocks seems to have mostly ended around 1910. Consequently, if you find a concrete block building surviving today, it is a relatively safe bet that it was constructed between 1904 and 1910. 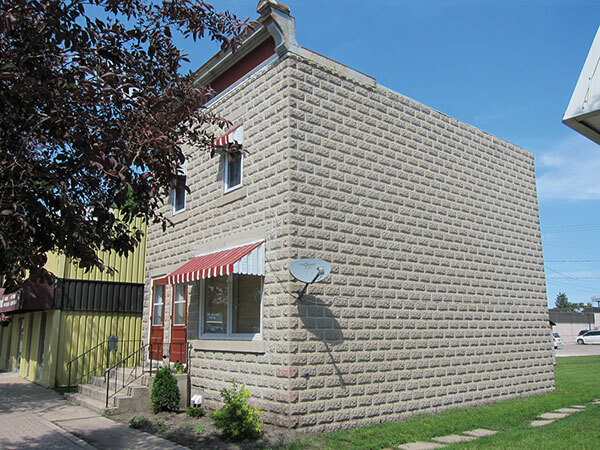 A few examples of concrete block buildings are shown on the following pages. 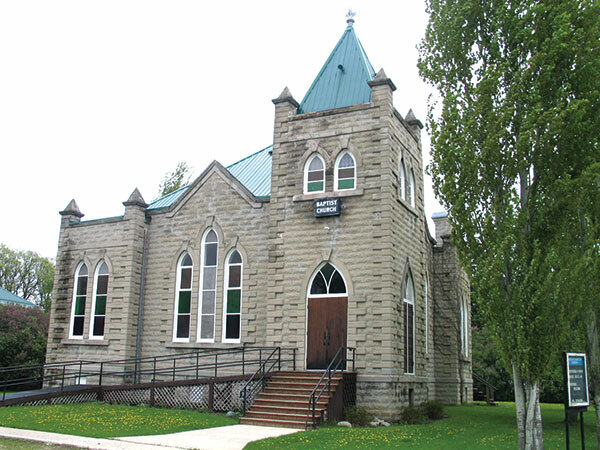 The Bergthaler Church Waisenamt (48 Main Street, Altona) was the local home for a mutual aid association introduced by Mennonites who settled in southern Manitoba in the 1870s. Based on a centuries-old tradition of Mennonites in Prussia and Russia to administer estates and aid widows and orphans, the institution collapsed during the Great Depression of the 1930s. The building has accommodated various functions since then and is now a private residence. Booth Concrete Granary (RM of North Norfolk). This unique building, near the village of Sidney, was constructed by Frank Thomson for the Booth family. 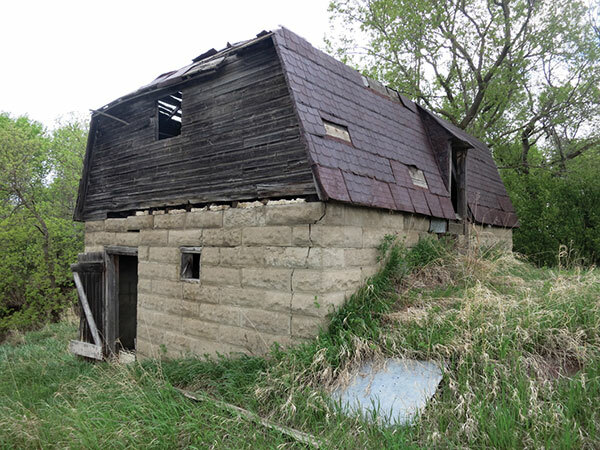 It is situated on the side of a hill so the farmer could transfer the harvested crops into the granary from the uphill side and, when it was time to deliver grain to a local elevator, it was a simple matter of parking a wagon on the downhill side and letting gravity do the work. The downhill side of the building had two openings, one for the main floor and one for an upper floor, so the farmer could store grain on both levels. Kilkenny General Store (Broomhill, RM of Albert). This two-storey building was built for William Kilkenny and his brother John. In its heyday, the Kilkenny store was the centre of the community. A hand-operated gasoline pump sat at the south end, in front of an entrance to the store and post office, with an implement agency and garage at the north end. Rooms on the upper storey were used as residential space. The business was operated by a succession of Kilkennys until it closed in September 1964. The building’s east and south walls are made from patterned concrete blocks. The roof is gone and the interior floors have failed in several places but, otherwise, the concrete structure is largely intact. Pressed metal wall and ceiling panels from the interior have been salvaged by a grandson of the last owner and are available for purchase. Matchettville School No. 1342 (RM of South Norfolk). According to local legend, the district was originally known as Bachelorville due to the scarcity of women in the early days of settlement, and was renamed Matchettville when the bachelors married. A more likely possibility is that it was named for members of the Matchett family who homesteaded here. The Matchettville School District was established in May 1905 and, the next year, a concrete-block school building was erected by Frank Thomson. The school operated until 1951 when, due to declining enrollment, it closed and remaining students were bused to school in Treherne. The building was sold to a local farmer and used as a granary. Its south wall was damaged extensively when an agricultural implement collided with it in 2003. The Emerson Baptist Church (Emerson) was designed by Winnipeg architect Hugh McCowan. It was built in 1905 by local contractor David Wright, who also built a manse for the pastor, as well as several private residences around town, most of which survive today. 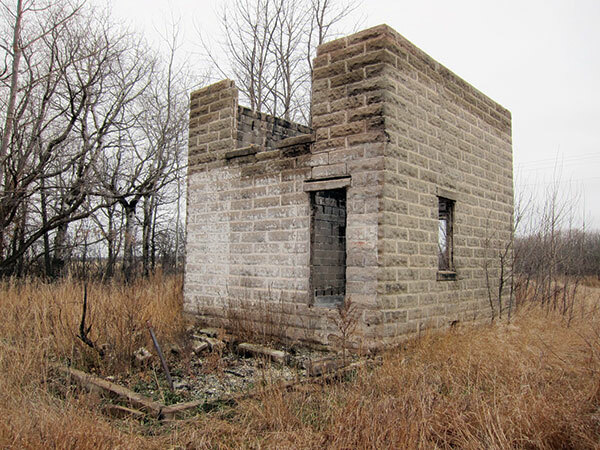 Local lore has it that Wright stopped making concrete block buildings when his mould broke. Lansdowne Municipal Office (Arden). This impressive building was constructed in 1904 of blocks made by the Arden Cement Block and Building Company, established that year by municipal official Maurice Boughton. It has the distinction of being one of the few municipal offices in Manitoba that is still used for its original purpose. Nelson House (RM of North Norfolk). This small two-storey house northwest of Austin was probably built by local farmer Frank Thomson who was responsible for many of the concrete-block buildings in the area. Purchased in the 1940s by returned war veteran Joe Nelson, it served as the Nelson family home for many years but was abandoned when, in 2011, a suspected arson fire destroyed all but its strong, concrete walls. A. E. Gardiner Building / Seton Centre (116 Main Street, Carberry), ? Mercantile Building (Lyleton, RM of Edward), ?